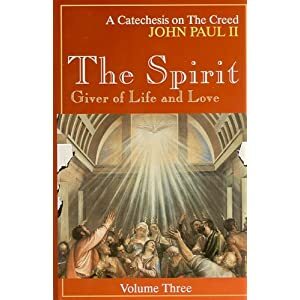 Here is the series of catecheses on the Holy Spirit by Pope John Paul II. This is the third part of John Paul II’s Catechesis on the Creed. This series follows John Paul II’s Catechesis on Jesus and precedes his Catechesis on the Church. It began on April 26, 1989, and concluded on July 3, 1991, and it includes 82 general audiences. These audiences formerly were available in book form from Pauline Books & Media; however, the book is now out of print. You might be able to find it on Amazon.com or other such places where used books are available. The Vatican website has an easy-to-miss, special section which includes 80 of these 82 General Audiences on the Holy Spirit. These audiences are not available in English on the regular part of Vatican website (under John Paul II’s Audiences).